U-Line has been in the cooling business for decades. Since 1962, the brand has been synonymous with high-end compact refrigerators, freezers, and ice-maker units built in for under-counter use. Since its humble beginnings, U-Line has become the first company to patent a residential under-counter ice maker. It is also the first North American company to manufacture a combination refrigerator and ice maker, and is the first to create an under-counter wine cooler. In recent history, U-Line achieved the Interior Design Magazine Best of the Year Award in 2010 for its Glass Door Refrigerator model 2175RCG. In 2009, its Echelon 2175R and Origins 1175R models received the highest possible energy efficiency ratings by the CEE (Consortium for Energy Efficiency). A typical U-Line product has several options for customization and adjustable parts. Appliances are listed in the 1000 series or 2000 series. Popular appliances are typically models in the Echelon, Origins, Wine Captain, and Combo product lines. The difference between models in the 1000 series and 2000 series is described by U-Line as the difference between “core products” and “Best-In-Class products,” respectively. Units in the 2000 series offer Touch Glass Digital Technology, adapt to a 3/4-inch full overlay panel, contain fully extended wine cooler racks, and sport a contemporary grille design. The 1000 series features models that use digital touch pads, wine racks that extend 3/4 of the way out, accept 1/4-inch inserts, and have a more traditional grille design. Units in the Echelon series have black cabinets and black interiors, while models in the Origins series have white interiors. Some of these are also Combo units, which come in three different varieties: dual fridge and ice maker, dual fridge and freezer, and a drawer unit with all three (refrigerator, freezer, and ice maker). The Combo CO1175, as an example, contains both a refrigerator and a sizable ice maker. 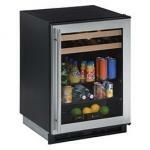 The U-Line Wine Captain units are well-known and come in many measurements, shapes, and styles. Each compact unit is fitted inside with beechwood storage trays that have been coated with a clear vinyl sealer. These trays can be left alone as-is, or they can be stained to match a specific interior design theme by the owner. Wine Captain units also feature digital temperature controls for triple-zone, dual-zone, and single-zone refrigeration. For example, models in the triple-zone category are generally set at 55 degrees for red wine, 50 for white wine, and 45 degrees for sparkling drinks. With hundreds of models and options to choose from, U-Line offers “investments” to consider for both homeowners and professionals. The word “investment” is key here, since U-Line products are rarely cheap. Models do come with a one-year warranty for parts and labor as well as a five-year warranty on the sealed system (meaning the compressor, evaporator, valves, tubing, and other parts). If shopping for an outdoor refrigeration unit, U-Line stresses the importance of looking for a UL certified model. These units operate best between the outdoor temperatures of 45 and 110 degrees F. Anything outside these temperature ranges may compromise the functionality (and warranty) of the unit. Also, every U-Line appliance requires front ventilation, so it’s not ideal to use them in a closet or storage room. This 1115RS compact refrigerator in the Origins series is a good representation of what to expect from a U-Line refrigerator. 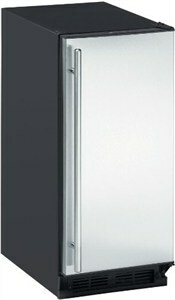 This compact refrigerator from U-Line is one of few models available in its particular size. The 1115RS comes from the Origins series with a capacity of 3.3 cubic feet, and it measures 14-15/16 inches wide by 34 inches high.